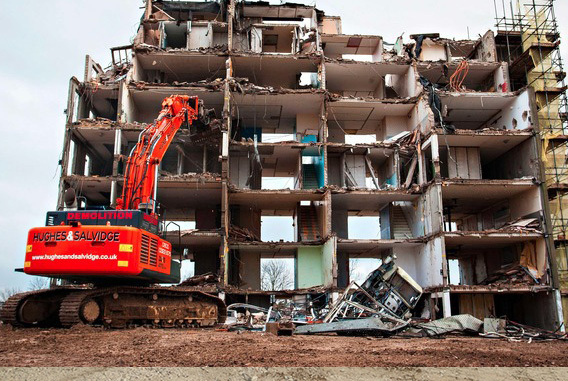 Hughes and Salvidge Ltd carry out demolition work on a variety of building structures across all sectors, from commercial or industrial warehouses to high-rise blocks of flats. Each project presents its own unique challenges in terms of the surrounding environment to the structure and the materials used in a buildings construction. Such variety of elements to a project mean different methods of demolition need to be deployed in each individual case. Ahead of each project a pre-start meeting takes place and Risk Assessments are produced. A Method Statement, containing the methods of demolition techniques to be used, is then produced to control the highlighted risks. All of our demolition work is carried out to BS6187:2011 and all work complies with all applicable legislation, Guidance Notes, Acts, British Standards and Approved Codes of Practice. See our health & safety certifications for more information. The Method Statement includes details of any required Asbestos Removal within the building, before a soft strip can take place, followed by a superstructure demolition of the building and then a substructure demolition of the floor slab and foundations. Soft Strip includes the removal of all fixtures and fittings, usually by hand and with the use of hand tools, such as crowbars and Stanley knives, or 110v power tools, such as reciprocating saws or angle grinders. The Superstructure Demolition of a project is unique and methods used to demolish the structure depend on many factors, such as size of building, existing condition of the building, and vicinity of the building to other structures and surrounding environmental elements. With larger structures, chimney stacks or bridges – where the above plant cannot be deployed safely in demolition – explosive demolition methods are used. With explosive demolition projects, we use a specialist, certified contractor to carry out the weakening and explosion of the structure after we have soft stripped the building. We return when the site has been made safe after the explosion and carry out the clean-up of the site debris with our plant. Hughes and Salvidge also have extensive experience of ‘system’ builds and have demolished many schools and public sector buildings that incorporated CLASP, Hills and Vic Hallam methods in their construction. Such systems inevitably produce risks in regard to Asbestos, in both panels and columns, and Hughes and Salvidge have a wealth of knowledge and experience in managing the removal and disposal of asbestos materials prior to demolition of any building. With high HSE standards of training and strategic project planning Hughes and Salvidge ensures safe removal with minimal disruption. Totally independent UKAS approved analysts are employed to undertake air sampling / fibre counting and bulk sampling in full compliance with EN450001 to ensure that the work is carried out in a completely safe manner.